Gourmesso Capsules de Thé pour NespressoThere are 4 products. Mint tea capsules for Nespresso. 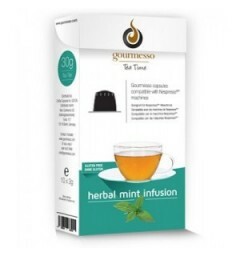 These Nespresso-compatible capsules of mint tea combine very well the spiciness of peppermint and chamomile. Plum Cinnamon Tea Capsules for Nespresso. A whole palette of fruit notes is grouped in this Nespresso-compatible cinnamon plum capsule. Black Tea Capsules for Nespresso. This powerful and aromatic black tea has an incomparable bouquet. This Nespresso compatible capsules ravirat all your senses. 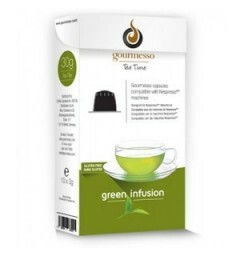 Gunpowder Green Tea Capsules for Nespresso. These Nespresso-compatible capsules of gunpowder tea reveal a powerful aroma of the most exquisite.